Great Camping utensils are necessary for every camper. Whether you are planning for your first camping weekend or you are an experienced camper, you need quality utensils and silverware. The quality and durability of anything you buy matters. That also applies to cutlery. Having good cookware can make your camping trip thrilling. After a beautiful day of exploring and fun outdoor activities, the last thing you should deal with is bad cookware. You might have the most expensive ingredients to prepare your food, but the wrong cookware might ruin your meal. 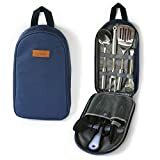 To save you from the disappointment, we have done our research and come up with a detailed list of the best camping utensil sets. 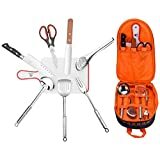 Before you hit the supermarket to buy Camping cooking utensils set, go through this review to identify the best product for your camping needs. There are many items available in the market. We want you to buy the best. All the products on our list have impressive features that will make your meal preparation and eating easier. To start, let us help you figure out the things you need to consider before you make your purchase. Why You Need a Cooking Utensils and Silverware Kit? How to Choose Cooking Utensils and Silverware? Are you wondering whether you should buy a kit or get individual pieces? Wide selection of cutlery. By buying a Camping Utensils Kit, you not only get the basic items but more useful and interesting products. Affordable. You get different cutlery at a reasonable price. Way it is cheaper than buying single items. Get unique items. 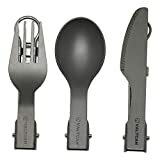 Depending on the kit you buy, there is the possibility of getting special cutlery not easily available in single pieces. Carry bag. Having a carry bag helps safely store your items. You only need to carry the essentials. There is no need to go on an unnecessary shopping spree for items you will not use. Below is a list of the important Camping kitchen utensils you require to make your camping experience better. Fork. Great for eating fish, pasta and noodles. Spoon. It offers the versatility of being handy for different uses. Spatula. Ideal for cooking and serving food. Knife. One of the crucial items you need when enjoying the outdoors. From preparing your food to cutting your steak. Can opener. You most likely will have a couple of canned foods to open. Bottle opener. So easy to open your fizzy drink when you have an opener. Dining in the woods does not need to be a hustle. Thankfully, these below factors will help you make the right decision. 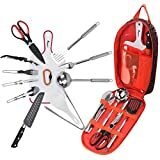 By reading this Camping utensils review, you will be to pick the perfect set. The length of your trip will determine the quality of your Camping utensils set. If you plan to have a long vacation, it is advisable to get a great quality set. This will save you money as you can use them for your next trip. Again, you have the guarantee that your outdoor escapade will not suffer because of poor utensils and silverware. Most Camping food utensils will either be plastic, aluminum, titanium and stainless steel. There is also Bamboo camping utensils. Of all materials, titanium is highly priced compared to the other options. It is durable and lightweight. If you want quality and durability, and you do not mind the price tag, Titanium is the best. Plastic camping utensils are cheap with no guarantee of durability. This is a good option if you are planning a short trip or running on a shoestring budget. Stainless steel utensils have more weight compared to Titanium. They require great care and are high maintenance since they are prone to corrosion and rust. Even though they are not as costly as Titanium cutlery, they are not cheap either. Aluminum is a good option as it makes quality cutlery. Perfect if you want a durable option while being conscious of your spending. When it comes to wooden camping utensils, durability might be a problem. Nonetheless, they are portable and have a unique appearance. Your destination determines the type of Camping kitchen utensils set you will choose. Are you using your car to carry camping gear? In that case, the weight of utensils is not a factor to consider. However, if you will be walking or hiking to the site, weight is of great consideration. Below is a list of the best camping utensils worth your consideration. We hope that by the end of this review, you will find one or two favorite pieces. This stainless steel kit offers a dose of civilization when you go camping. Comes with a beautiful carry bag that secures the cutlery in place. 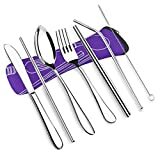 Part of the 9-piece package includes a serving fork and spoon, 2 spatulas, paring and chef knife, cutting board, scissors, and tong. This entire shiny set is useful and great for your outdoor experience. From a glance, the utensils have a stunning finish. Buyers on Amazon are happy about this product. This LIFE 2 GO set comes packed with everything you need to liven your meal preparation process. The kit has some slight weight to it, but it will not affect your outdoor cooking. Do you want a reasonably priced Camping cooking utensils kit? Camping Travel is one you should add to your wish list. You get a cutting board, tongs, soup spoon, spatula, scissors, meat knife, fork, and a steel turner. Part of the package comprises a stylish storage pouch. Made of stainless steel, you get an awesome set with multiple uses. Everything you might need for a great cooking experience is included in this kit. The bag, however, is big compared to the size of the tools. This set of 8 is ideal for your trip and works perfectly. By buying this set, you get great value for your money. This compact cookware kit comes in 10 pieces. You can find a variety of cutlery in a quality carry bag. The case has enough room for you to include other items. 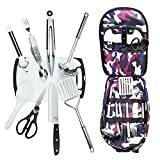 Other than the carry case, you get a cutting board, knife, bottle opener, rice paddle, 7-in-1 hobo tool, scissors, tongs, ladle and a spatula. The entire kit is made of stainless steel. This Camping eating utensils set is a good choice if you have a limited budget. You get decent tools with a variety of uses. The carry bag allows you to organize your tools easily. You no longer have to worry about losing any of your utensils. 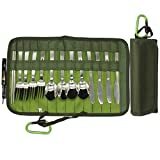 Equipped with 8 pieces of cutlery, this kit is ideal for your outdoor activities. You have the luxury of carrying the essential parts of your kitchen with you. You can have your kit in black, green, orange or blue. When you buy the package, you get a soup ladle, tongs, cutting board, bottle opener, spatula, rice paddle, knife, and a rice paddle. If you are looking for a good set to use, you might actually like this kit. It is not the premium set of tools, but at least it is functional and useable. The case is enough to protect your tool from damage. This kit conveniently combines all your essential tools in one compact package. You can get this kit in green, orange, black or blue. 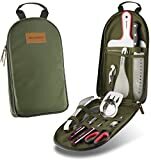 The travel bag has different compartments for each tool. Variety of the tools include a rice paddle, knife, spatula, cutting board, scissors, tongs, ladle, and a wine opener. There are 4 different types of this kit with different prices, each made with stainless steel. You no longer have to spend hours trying to wrangle up your kitchen tools. With this kit, you have enough utensils to make and eat your favorite meal. One main concern is the overbearing smoke smell when you initially open the set. Apart from that, everything seems to check out okay. This is one of the Lightweight camping utensils here. It comprises of 3 items in the set. You get a spoon, fork and serrated knife. The Valtcan is a good addition to your camping tools. Their portability makes it highly convenient when you need a few essential items in hand. The fact that you can carry this set in your bag and with no noticeable change in weight is incredible. You get 3 basic items with the right design and grip. 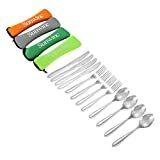 Other than camping, feel free to use this Camping silverware set at home or work. In as much as Titanium Products are highly portable and convenient, they can be quite flimsy. This camping silverware set on the other hand has some strength to it. You can get either the 3 or a 4-piece kit. For the 3 pieces, there is a serrated knife, spoon, and fork. The 4 piece kit has everything in the 3 pieces, plus chopsticks. The design of the chopsticks is a concern. Unless you are a pro, then you might have a few issues using it. For the rest, the quality is okay and brings some sense of style to basic cutlery. This stainless steel set comes in a vibrant Neoprene case. For the cases, you can choose 4 different colors. With this kit, you get a spoon, fork, and knife. You can easily fit this set in your pocket or backpack. The Sunwinc might not have the best quality, but you will find the items useful and practical. It helps to have such a kit within reach when camping. Overall, the quality is decent enough to see you through a couple of camping trips. Another entry of stainless steel equipment on this list. For the VICBAY, you can choose between the 4-piece and 7-piece set. For the 4-piece, you get a knife, fork, spoon and chopsticks. A cleaning brush and 2 straws are included in the 7-piece kit. If you are tired of using plastic spoons and forks every time you go camping, get these ones. They have good quality and are reusable. Stainless steel is awesome since it is easy for you to clean and maintain. Just as the name suggests, this is a small sized set for 2 people. The kit comprises of a spoon, knife, fork and a bottle opener. Apart from the opener, everything else in the package comes in two’s. Made from stainless steel, the cutlery comes in a colorful travel pack. 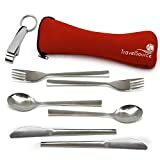 Just like any product, the TravelSource has some issues, but none interferes with the quality of utensils. Apart from the case, it might actually be one of the best camping silverware. Instead of gambling with the quality and the uncertainty of durability, get this set. Getting 15 pieces in one set seems like a fair deal. 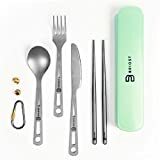 This stainless steel package comprises of forks, spoons, knives, chopsticks, a Carabiner, and a wine opener. Trying to create a balance between cost and quality can be tricky. Especially when you have a tight budget. With this kit, there is no need for any tradeoffs. You can consider this as among the best camping cooking utensils. A convertible case houses 13 different pieces of cutlery. You can fold the case or use it in an upright position. This set is good value for your money. With that, you get spoons, forks, knives, and chopsticks. For a Camping dishes and utensils kit, quality and durability is an important factor to consider. This Wealers 13 piece set does not disappoint. With this package, you get an amazing array of basic tools for a fair price. The case easily folds into a compact size you can carry. In as much as the kit does not have an endless list of tools, you get good quality for the essentials you need. With so many options to choose from, we have done the research to help you figure out the best product. Make sure you read each product in detail to figure out if it suits your camping needs. All the products on this list are travel-friendly and within a reasonable price range. We hope you get to enjoy your cutlery set.